The new dynasty: - or - the little Corsican Gardiner planting a royal-pippin-tree. - 'All the talents', busy, in clearing the ground of old timber. London, H.G.Bohn, 1851. Etching, 255 x 360mm. Coloured. Trimmed from larger sheet. 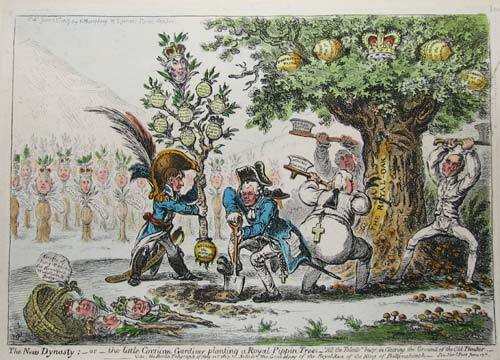 Napoleon, having pruned the monarchies of Europe, helps reformers attack the British Royal Oak. On top of the new tree is Lord Moira, who claimed to be descended from the Irish royal race of Ballynahinch. First published 1807.